Wash and blow dry hair as usual. • Plug in appliance and select desired temperature to suit your hair. • Allow appliance to heat up. • If you have medium or long hair, you'll find it easier if you start curling at the back of your head. For short hair, it's easier to start at the crown. • The most important thing is to curl only a little hair at a time, in small sections of about 1-2". Separate your hair and start rolling from the tip of the section. • With hair secured by the iron clamp, roll up to about an inch from your scalp. Hold it there for 10 seconds. • Release the curl by opening the curling iron and sliding it carefully out. If you have long hair, you can pin the curl in place with a hair grip to preserve its shape while you keep working. • If there are sections of hair that you don't want curled at the tips, just wrap the hair around the barrel of the iron as described above without using the clamp, hold for 10 seconds and release. • Repeat for the rest of your hair. • Set curls with your desired hair spray and styling products. 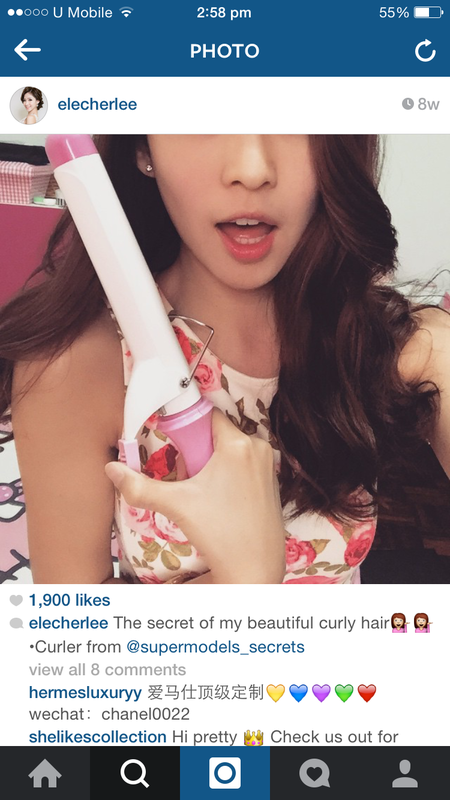 "Beautiful @elecherlee using our 38mm Hair Curling Iron for bombshell look!"